Hunter Watson was a distinguished Edinburgh University athlete who became for many years the respected General Secretary of AAAC. He was a sports historian and a medallist in the Scottish Championships: second in the 1956 One Mile and third in the 1960 880 yards. Follow the link to find out more about Hunter’s career. Here is the start of his article, which was entitled ‘Club with a rich tradition’. “Although officially founded in 1952, Aberdeen Amateur Athletic Club has its origins in the mists of time. Many of the trophies, notably the Angus Cup and the King Trophy, either belonged to Aberdeen’s first club, the Aberdeenshire Harriers, or were presented by former members of that club. Founded in 1888, only three years after Clydesdale Harriers became the first of Scotland’s harrier clubs, the ‘Shire Harriers stamped their memory on North-East sport through minutes of meetings which make interesting reading. On Tuesday January 21st, 1930, for instance, it was noted: “The chairman closed the meeting owing to rowdyism.” It transpires that the treasurer had refused to make money available for the purchase of an oil stove for the clubhouse at Wellington Bridge. “Prior to World War Two, there were six open clubs in the city – the Shire, YMCA Harriers (founded 1912), Shamrock and Thistle for men, the Bon-Accord and Aberdeen Ladies for women. Only the Shire survived the war years. That, in turn, led to Jimmy Adams contributing an article to the ‘Green Final’ of October 11th, 1947, in which he suggested “A way out of the slump in athletics in the North-East.” The same article came up with the idea that Linksfield Stadium should be utilised for more than football. The Shire Harriers had tried and failed to gain access to Linksfield on several occasions. The newly formed club managed to arrange at least one match in the summer of 1952, against RAF Dyce. (The team representing RAF Dyce consisted of young men who were based at the Dyce aerodrome while doing their National Service.) Aberdeen AAC won the match. The new club generated sufficient publicity to make people in and around Aberdeen aware of Aberdeen AAC, something that increased the probability that it would attract new members. A very important fixture was the annual Athletic Sports Meeting at Pittodrie Park, as Aberdeen FC’s ground was then called. Aberdeen Corporation began to put on a major sports meeting each summer. Athletics Weekly printed the results of the meeting held in 1954. Hunter Watson wrote that his expenses were paid when he travelled from Edinburgh to compete in the meeting held in 1956. Jimmy Adams had been actively involved in athletics in Aberdeen for over 30 years as an athlete and an administrator. He seems to have been an enthusiast and to have been highly regarded by the young people who had been attracted into athletics by the formation of the new club. One of those young people was Steve Taylor. Bill Angus, also a founder member of the Club, had been a highly rated middle distance runner while staying in America. He and Jimmy Adams worked along with the remarkable Donald brothers, (Colin, Roy and Kenny), who were fine athletes in their own right and found time, in addition to a busy farming life, to provide the backbone of the club for many years, in administrative tasks and as drivers of the Club’s only form of independent transport. Many of us fondly remember the green Ford Consul which ferried us to and from races for a number of years. On these long journeys home, the choice of entertainment was either Scottish Dance Music on the old Scottish Home Service, or a rendering of the latest Adam Faith song performed badly by Roy, the youngest member of the Donald family! For Aberdeen AAC, it was the women who made an early impact in Scottish athletics. SWAAA Senior Champions (who also broke Scottish National records) included the following. Pat Bellamy won the High Jump in 1955 and 1956. Alice Robertson, after securing a bronze medal in the 1955 100 yards, ‘did the double’ by winning the 100 yards and 220 yards in 1956. Her club-mate Agnes Paterson became SWCCU Senior Champion in that 1959 Cross Country. A newspaper report emphasises what a surprise this was, since Agnes was only 17 years old at the time. Nevertheless her bold front –running tactics led to a 60-yard victory over Scottish internationals Barbara Tait and Dale Greig, who won the title in 1960 (and in 1964 set the first officially recognised World Best time for Women in the Marathon). Sheena Crockett finished second in the 1960 Scottish One Mile Championship and won the 1961 East District 880 yards and One Mile titles. In Track and Field, Steve Taylor finished third in the 1959 Scottish Mile Championship. He won the East District One Mile in 1960 and then improved to a silver medal in the Scottish Championship Mile. Steve also won the Inter-District Mile Championship. In 1961 he retained the East Mile and also won the 3 Miles before going on to victory in the Scottish Championship 3 Miles, outsprinting his soon-to-be club-mate Alastair Wood, who joined AAAC in January 1962. In 1962 Steve was first in not only the East 3 Miles but also the Scottish 3 Miles. In 1965 he was second in the Scottish 3 Miles, behind Lachie Stewart; and in 1966 secured silver again, setting a fast time of 13.47.8, not far behind Fergus Murray. Steve Taylor also won the Scottish Ten Miles Track title in 1970 and, almost as an afterthought, was a 2.19 Marathon runner. John Waters finished third in the 1960 Scottish Championship Javelin and then went on to win the title in 1961. He was East champion in 1960 and 1961. Several other AAAC men produced very good track performances. 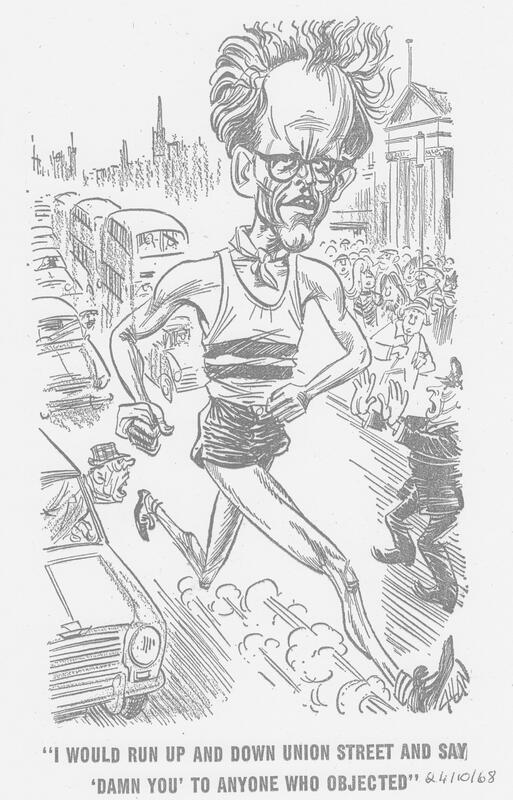 Alastair Wood, running for Aberdeen University, had won a bronze medal in the 1955 Scottish Mile. As a 3 Miler (running for Shettleston Harriers) he won the Scottish title in 1957 and 1959; and also became 6 Miles Champion four times in succession, from 1958 to 1961. Alastair set Scottish Native Records for 3 Miles (13 minutes 39.8 seconds in 1960) and 6 Miles (29m 10.2s in 1958 and 28m 42.8s in 1959). Alastair Wood joined Aberdeen AAC in Summer 1961 and, together with Steve Taylor, went on to inspire the next generation of Aberdeen athletes. Wood won Scottish Marathon titles in 1962, 1964, 1965, 1967, 1968 and 1972. In the 1962 AAA Marathon he was a close second to that year’s European and Empire champion Brian Kilby. Subsequently, running for Great Britain, Alastair Wood was a valiant fourth in the European Marathon in Belgrade. Then he represented Scotland in the 1962 Empire Games Marathon in Perth, Australia. In 1966 he set a new European record of 2.13.45 in the Forres marathon. For some obscure reason, the latter time has never been accepted by the SAAA, but was ratified by the AAA in 1967, and is now recognised by the Association of Road Running Statisticians (www.arrs.net) as the world’s fastest time in 1966. In 1967 Alastair was second in the AAA Marathon, clocking 2.16.21, only 13 seconds behind fellow Scot Jim Alder. On a bitterly cold December day in 1969 at Pitreavie, Alastair Wood was paced for most of 30 miles by his friend Steve Taylor. Then Alastair went on to break the World Record for 40 Miles Track (3 hours 49 minutes 49 seconds). Steve had the satisfaction of sharing with Alastair Scottish Native and All Comers Records for 30 kilometres, 20 miles and Two Hours. In 1972 Alastair Wood broke the record by over ten minutes in the prestigious London to Brighton race (52 and three-quarter miles in 5 hours 11 minutes two seconds). In Paris 1974, aged 41, Alastair became World Veteran Marathon Champion. He was a versatile athlete and a truly world-class marathon and ultra-marathon runner. Bill Ewing was educated at Aberdeen University and showed great athletic promise by finishing third in the 1963 Scottish Championship One Mile. In 1966 he won the East District Steeplechase, a title he retained in 1967, when he also sprinted to victory in the Scottish Championships Steeplechase at Grangemouth. The runner-up that day was Gareth Bryan-Jones, a future Olympian. In total, Bill won 5 Scottish medals in the Steeplechase (gold, silver and three bronze). His personal best (faster than the Scottish Native Record) was 8.47.8, run in 1968. In 2017 this is still the AAAC club record! Bill represented Scotland in the 1965 International Cross and secured the 1966 East District cross country title. He went on to become a successful veteran runner. In Cross Country, Aberdeen AAC had success during the 1960s. Steve Taylor, having finished 7th in the 1960 Scottish National XC, during his first season as a senior, became the first AAC male athlete to gain International Cross Country selection. Steve was 4th in the 1961 National and chosen for Scotland again. Bob Duncan was third in the 1960 Scottish Junior XC. Before he joined AAAC in Summer 1961, Alastair Wood had won the Scottish XC title in 1959, leading Shettleston to the first team award. Alastair had run for Scotland in the International in 1959, 1960 and 1961 (when he finished an outstanding 7th). Wood and Taylor both made the Scottish team for the International in 1962. Alastair Wood gained further Scottish vests in 1963 and 1964. 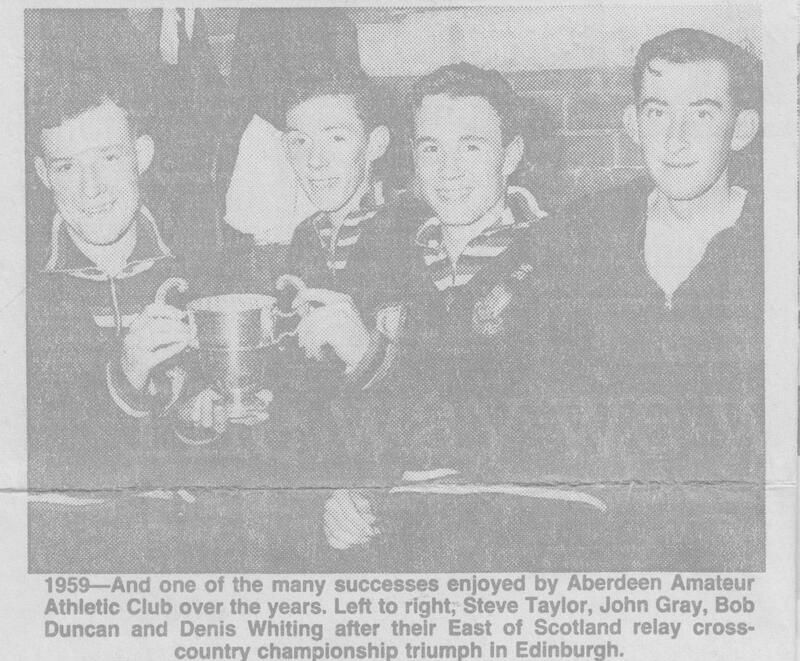 Aberdeen AAC came close to winning the Scottish National XC team title on several occasions: finishing second in 1964 and 1965 and third in 1972. However the narrowest and most frustrating defeat was in 1968 at Hamilton Racecourse. Before the race, officials decided to disqualify one of Aberdeen AAC’s fastest runners, Ian Mackenzie, on the unconvincing grounds that he was mainly a Forres Harrier. This became a major reason why the club missed out on gold – by a single heart-breaking point. The North-East Cross Country League, featuring teams from Aberdeen and St Andrew Universities, Dundee and Perth, as well as AAAC, provided excellent race training for younger athletes as well as allowing established stars to show their class and challenge others to improve. AAAC usually won the team titles. Donald Ritchie and Colin Youngson were only two Aberdeen University runners who, in the late 1960s, eventually secured victories in League races. Both became valuable team members for AAAC. There was an annual cross country fixture for the Carry Trophy (donated by the jewellers of that name). This was between teams (of nine runners) from Dundee and Aberdeen. In 1960, the first nine home were all either AAAC or AU athletes! Steve Taylor mentions one unusual contest which added fitness and enjoyment to the sport. “Athletics Weekly” (AW) was the weekly magazine for Britain’s competitors. It sponsored a two man 10 mile track relay (which entailed each runner completing 40×220 yards with a minimum of rest. John Gray and Steve Taylor brought international recognition to AAAC by finishing 2nd in the 1959 British rankings of this popular event at the time, beaten by only 15 seconds by the Portsmouth AC duo of Bruce Tulloh and Martin Hyman, both of whom became major players in British athletics. In later years, Steve paired with Bob Duncan or Alastair Wood to run even faster and maintain a high place in the British list. Track and Field Club Championships have always been keenly contested. AAAC has an amazingly detailed list of best performances. This is updated in an impressive Yearbook. All Time Top 20s in Senior events include highly-ranked adjusted pre-metrication marks (i.e. before 1969) by Bill Ewing, Steve Taylor, Mel Edwards and Alastair Wood. Track and Field leagues have always featured in the story of Aberdeen AAC. In the 1960s there was a North East Track and Field League, which the club usually won. In the 1970s the Scottish Men’s League was started in 1972, followed by the Scottish Young Athletes’ League (1975) and the Scottish Women’s League (1976). These, and their modern equivalents, have resulted in many individual and team successes for AAAC athletes. The club has frequently found a place as one of Scotland’s very best Track and Field teams. Road Running was very important for Aberdeen athletes, especially in the 1960s and 1980s. A glance at the results of top Scottish events like the Tom Scott Memorial Ten Miles and the Two Bridges 36 Miles will prove that Aberdeen men won these races or were placed in the top three. Team wins were also recorded. Alastair Wood’s Scottish Marathon wins have been mentioned. Donald Ritchie, later known as Don, was second to his mentor in the 1967 and 1968 Championships and in the 1970s and 1980s developed into the greatest ultra-distance runner of the 20th Century. He won many of the most famous ultra events in Britain, Europe and America and set an amazing number of world records. His fascinating, detailed autobiography ‘The Stubborn Scotsman’ was published in 2017. Both Don Ritchie and Mel Edwards became Members of the British Empire (MBE) for services to Athletics and Charity. This was especially appropriate for Meldrum Barclay Edwards, who referred to himself for some time thereafter as MBE squared! In 1964 Aberdeen finished fourth, with Ian Mackenzie, who was often North District champion, making his debut with the fastest time on Stage Three. The 1965 E to G produced a sixth place, with Donald Ritchie running Stage Three. Then it was fourth in 1966, with Mel Edwards running the fastest on Stage Six. Amazingly, second-equal was the 1967 result, with Mel fastest (and handing over first) on Stage Two and new recruit Terry Baker fighting out an incredibly close duel with Shettleston’s Henry Summerhill, and setting the fastest time on Stage 8. In 1968, strengthened by International athletes Peter Stewart and his brother Ian, Aberdeen finished second to the dominant Shettleston Harriers, despite Alastair Wood breaking the Second Stage record (and handing over first) and Bill Ewing setting the fastest time on the 8th Stage. The AAAC running order was Ian Mackenzie, Alastair Wood, Peter Stewart, Joe Clare, Steve Taylor, Ian Stewart, Donald Ritchie and Bill Ewing. That was the peak for the Aberdeen team of the 1960s, although they regained second place in 1972 (again behind Shettleston Harriers, in their final supreme season) and the race featured an incredible Second Stage record (which was never broken) by Ian Stewart. That team was: Graham Milne, Ian Stewart, Ian Mackenzie, Donald Ritchie, Steve Taylor, Alastair Wood, Rab Heron and Peter Duffy. Participation went on, including 3rd in 1973. After inevitable decline the 1979 team won most improved medals for 8th place, with Denis Shepherd moving up two places while setting the fastest time on the last leg. In 1981 it was third again, the team strengthened mainly by improving young AAC athletes. Another third place was achieved in 1982. Then, at long last, came the breakthrough! Aberdeen AAC finally won the E to G in 1983, after a close battle with Bellahouston Harriers. The team included Graham Milne, Graham Laing, Ian Mathieson, Craig Ross, Peter Wilson, Fraser Clyne, Mike Murray and Colin Youngson. Milne, Ross, Wilson and Youngson were Scottish International marathon men; Laing had finished seventh in the 1982 Commonwealth marathon; Mathieson was a hill-running International; Murray a talented middle distance athlete; and Clyne often a GB marathon International who ran for Scotland, finishing tenth, in the 1986 Commonwealth event . Their winning time that day (3 hours 35 minutes 30 seconds) was the second-fastest in the long history of the Edinburgh to Glasgow Road Relay. In 1986 and 1988 Aberdeen won again, with other good athletes featuring: Chris Hall, Simon Axon, Jim Doig and Ray Cresswell in 1986; and Dave Duguid in 1988. So many of those runners had been influenced by Alastair Wood and Steve Taylor. In his History of the SCCU, Colin Shields rated Aberdeen AAC the most successful E to G team of the 1980s, with three wins and four third places during the decade. This article was meant to be about only the first twenty years of AAAC. However the events which showed most clearly how strong the club had become (certainly the distance men) were attempts on the record for the John o’ Groats to Land’s End Ten Man Relay. These took place in 1972, 1973 and 1982. In 1972, due to lack of experience of this most testing of challenges, there were doubts about the best route and best tactics. Eventually the record was missed by only half an hour, despite the team being very good, including Alastair Wood, Graham Milne, Steve Taylor, Sandy Keith (a future GB marathon international), Donald Ritchie, Colin Youngson, Peter Duffy, Rab (or Rob) Heron (a future 2.17 marathon man and successful ultra runner), Martin Walsh (a tough, cheerful Welsh former middle distance runner with a weaker leg due to a motor bike accident) and Alastair Neaves, a talented young runner. Lessons were learned and with a slightly less impressive team, the record was broken by half an hour in 1973. Duffy, Neaves, Walsh, Wood, Heron, Taylor and Youngson took part again, as well as Innis Mitchell (an Aberdonian who had once won the Scottish Schools XC and won ‘Full Blues’ for both Strathclyde and Glasgow Universities), Joe Clare (a very strong runner who was a 2.18 marathoner) and young Derek Bisset (a promising middle distance athlete). Then the young stars made a huge difference in 1982. The incredible Alastair Wood (aged 49) battled through once more, along with Milne, Youngson, Ritchie, Clyne, Laing, Mike Murray, John Robertson (a durable young runner), Peter Wilson and George Reynolds (who were both to become Scottish marathon champions). The record was slashed by one and three quarter hours. 850 miles were covered in 77 hours 26 minutes and 18 seconds. There was absolutely no doubt that Aberdeen AAC was among the very finest clubs in Britain. Back: Steve Cassells, Steve Williams, Steve Taylor, Colin Youngson, Dave Lang, Graham Laing , Donald Ritchie. Front: Mike Murray, Alastair Neaves, Fraser Clyne, Peter Wilson, Graham Milne. Important Training? Endless track repetitions (often masterminded by Hunter Watson) at Linksfield; Mel, Ally and a few hopefuls attempting 20, 30, 40 or even 60 times 220 yards on the firm grass of King’s College field; the Sunday runs (at least 15 miles) from Ally’s house, up steep King’s Gate, through Hazlehead, onto the Pony Track, right to Countesswells Forest then left down to the Cults Road and Fartlek back into Aberdeen again, knackered; in the 80s a vicious, devil-take-the-hindmost Wednesday night ‘10 miler’, often in the dark, along King Street, down to the Prom, Bridge of Don, up steep hills to Balgownie, through a housing estate, over the Don bridge at Mugiemoss, up another testing hill, then left and back along the pavement, down St Machar Drive and collapse at Linksfield. Clyne and Laing’s record eventually proved the distance was nine and a half! Since then, Aberdeen Amateur Athletic Club (one of the largest clubs in Scotland) has nurtured male and female Scottish International and Champion cross country, hill and road runners as well as Track or Field athletes in all age groups. Several have run for Britain or taken part in Major Games. Team victories have been too numerous to mention. In 2015 AAAC was named Scottish Athletics Club of the Year. The continued success of Aberdeen AAC owes a huge amount to a succession of dedicated officials, coaches and the parents of young athletes. Hunter concluded his 1987 article thoughtfully. “”The fact that Aberdeen AAC is one of Scotland’s top clubs should not, however, be seen as anything other than a step in the right direction. Aberdeen will have to work hard to maintain that position in a day and age of ambitious clubs and talented athletes. The challenge must be seen as one of the attractions of the future – to coaches and officials as well as athletes.